I am going to share a few that I use and that my students use. 1. xtramath.org - I know I've blogged about it - but it is a good one for basic math skills. I like it since kids can use it at home and school. 2. Study Jams - again I know that I have talked about this one but it is really good and I'm not sure if you believed me the other two times I said it : ). My class loves these videos and we do the quizzes after the episodes or the next day as a review. 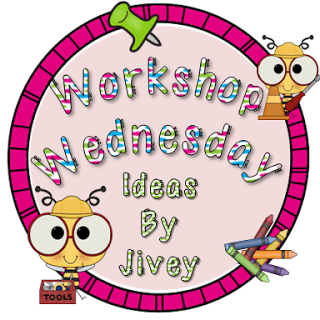 They are a great way to intro or review a topic. They are nicely paced. 4. 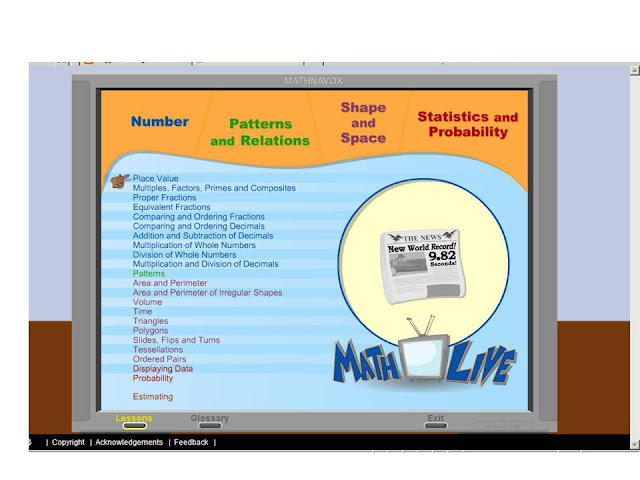 Math Live - these are cartoons episodes that you can use to introduce or review concepts concepts. Each lesson is broken down into segments, there are teacher resources, assessments and a activity worksheet for each lesson. 5. Houghton-Mifflin Education Place - I use this site for their worksheets, graphic organizers, emanipulatives (ssshh, I know I don't each in Connecticut but that is what I select when using this site). I like their worksheets for levelled practice since they often give reminders of the steps or terms students need to know for the activity. I also like that there is a reteach page, practice page, homework page and sometimes an enrichment activity. It takes a little clicking to navigate the site (select a state, select math, select the text book, the grade then you get to the page pictured below). 6. 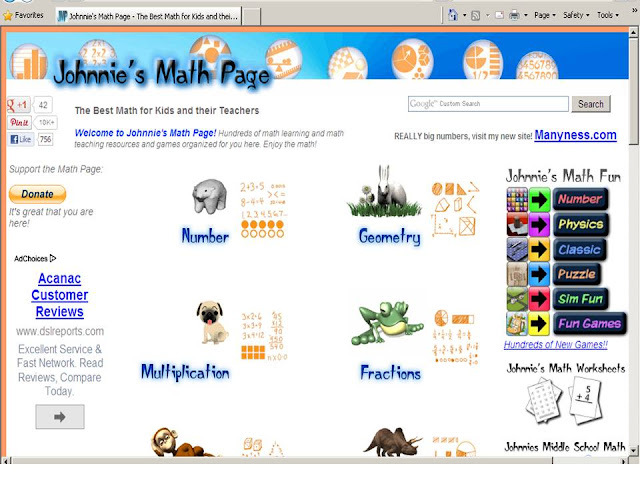 Johnnie's Math Page - this is a site that has a number of interactive games for students to play for a variety of skills. Hope you found something useful. Can't wait to find great new sites from all the other bloggers! Look at you with all your links!!! ;-) I haven't heard of Johnnie's Math Page or Math Live before, so I'm excited to check these out! These are great!! I have to check a few of them out that are new to me:) Pinned for later browsing! I have never heard of Math Live and will check that out. 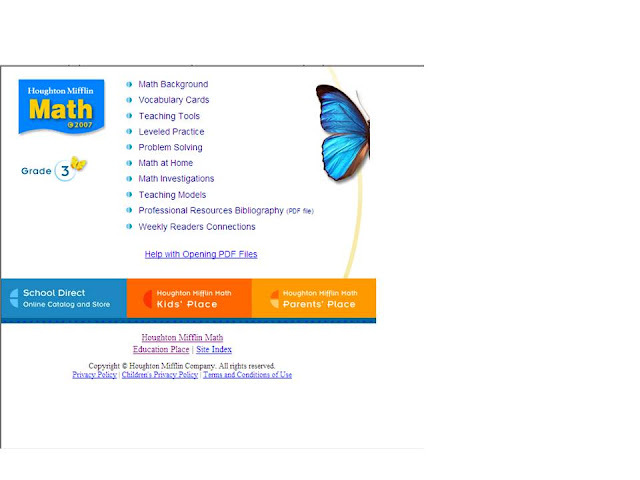 If you subscribe to Houghton Mifflin do you have access to Mega Math through your district? I LOVE that website. Very visual and hands on based ways of conceptualizing math ideas! Glad I found your site! Math Live is a new one to me! I will have to check it out. Math Live is new to me too! I'm excited about this one! Gosh, you have a lot of websites up your sleeve!!! Thanks for the new idea!